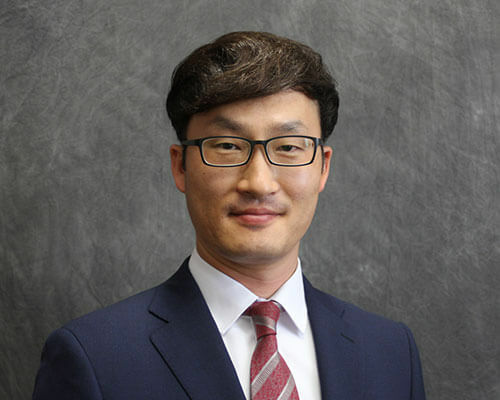 Home » Academics » Schools » Greehey School of Business » Faculty » Sung-Tae (Daniel) Kim, Ph.D.
Sung-Tae (Daniel) Kim, Ph.D., is Assistant Professor of Finance and Quantitative Management at the Greehey School of Business at St. Mary’s University. Prior to joining St. Mary’s, he served as Assistant Professor of Management Science at SolBridge International School of Business in South Korea. He received his Ph.D. in Operations and Supply Chain Management and an M.A. in Economics from the University of Nebraska-Lincoln. Kim has taught various courses such as Management Information Systems, Operations Management, Global Supply Chain Management, Research Methods, Special Topics in Marketing, Introduction to Microeconomics, and so on. His research interests include green supply chain management, logistics service strategy, and information technology management. His articles have appeared in such journals as Industrial Management and Data Systems, International Journal of Information Technology and Management, International Journal of Information and Decision Sciences, International Journal of Web-based Learning and Teaching Technologies, Information: An International Interdisciplinary Journal, and International Journal of Service Sciences. Kim’s awards and honors include Best Presentation Award, Korean Production and Operations Management Society (2017); Outstanding Paper Award Winner at the Literati Network Awards for Excellence, Emerald Group Publishing (2013); Best Faculty Service Award, SolBridge International School of Business (2012 and 2011); Outstanding Teaching Assistant Award, Management Department at the University of Nebraska-Lincoln (2009); Ogle Fellowship, Management Department at the University of Nebraska-Lincoln (2009-2010); and nomination for Best Paper in Service Management Track, DSI Annual Meeting (2008). Lee, D., Lee, H., & Kim, S. (2015). Outsourcing decision-making using analytic hierarchy process: a case study of a water park. Information: An International Interdisciplinary Journal, 18 (11), 4677-4688. Hwang, T. & Kim, S. (2013). The moderating effects of eco-oriented organizational culture on the green practice-performance relationship. International Journal of Services Sciences, 5(1), 74-94. Lee, S. M., Kim, S., & Choi, D. (2012). Green supply chain management and organizational performance. Industrial Management & Data Systems, 112(8), 1148-1180. Park, J., Choi, D., & Kim, S. (2012). Coordination mechanisms for decentralized supply chain in a capacitated distribution network. Korean System Dynamics Society, 13(1), 81-112. Lee, S. M., Jeon, S. R., & Kim, S. (2011). Mobile Internet services: Assessment of quality and satisfaction from the customer’s perspective. International Journal of Services Sciences, 4(1), 57-75. Jeon, S., Kim, S., & Lee, D. (2011). Web 2.0 business models and value creation. International Journal of Information and Decision Sciences, 3(1), 70-84. Kim, J., Yang, K., Nam, K., & Kim, S. (2010). Finding determinants affecting online education effectiveness in terms of learning satisfaction and application performance. International Journal of Web-Based Learning and Teaching Technologies, 5(2), 18-36. Kim, S., Lee, C. K., & Hwang, T. (2008). Investigating the influence of employee blogging on it workers’ organisational citizenship behaviour. International Journal of Information Technology & Management, 7(2), 178-189.